This is the kind of recipe that’s perfect for people who don’t have a lot of ingredients to work with. How do I know? My refrigerator only had some eggs, milk, cheese, butter, and experimental baking things in it. When I see these things listed, it seems like I’m big on dairy! These brownies are great! I’m usually a fan of box brownies because of their texture and taste, but this recipe surpasses the box mixes, hands down. This recipe makes seriously fudgy brownies with a nice crispy crust, crunchy corners and edges (the best part), and a chewy center. As I said before, the ingredients are nothing out of the ordinary (except perhaps the fleur de sel I sprinkled on top of my batter). The first step is melting the butter and the chocolate. Once you get this “chocolate soup,” let it cool for a few minutes. Next, add the sugars to the chocolate. Then add the eggs, one at a time, ensuring that the mixture is homogeneous after the addition of each egg. Then add the vanilla extract. Whisk the flour, cocoa powder, and salt together. Cocoa powder can be lumpy, so the main objective is to break up the chocolatey clumps while mixing it with the flour. Add the dry ingredients to the chocolate mixture, carefully folding everything together. 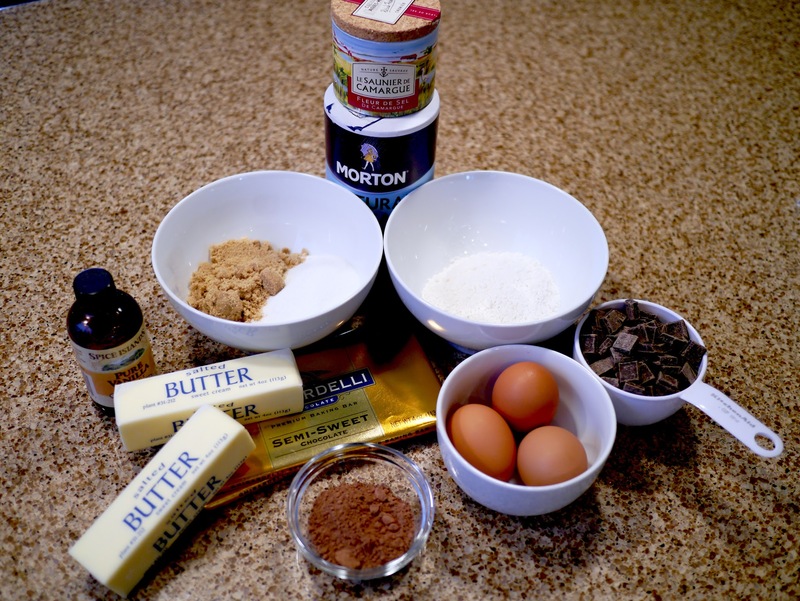 When the dry ingredients are just barely mixed with the chocolate, throw in the chocolate chips. After the chips are mixed in, pour the batter into a 9×9 pan, lined with parchment paper. Then put it into the oven for about half an hour. The brownies will be done when the sides start pulling away from the parchment paper. The result is a nice fudgy brownie. I feel like vanilla ice cream goes well with a lot of things. 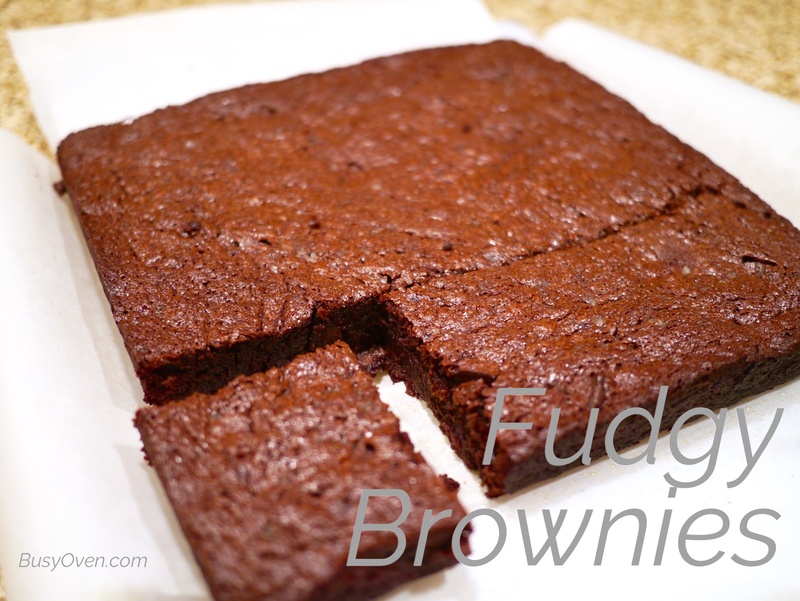 Fudgy brownies are no exception! Adjust the oven rack to the lower third position and preheat oven to 350F degrees. Line the bottom and sides of a 9×9 inch square baking pan with parchment, leaving an overhang on all sides. Set aside. Pour batter into the prepared baking pan and sprinkle the batter with fleur de sel, to your liking. Bake the batter for 35-36 minutes or until the brownies begin to pull away from the edges of the pan. A toothpick inserted in the center should come out with only a few moist crumbs when the brownies are done. All ovens are different, so keep an eye on them after 30 minutes and use the toothpick test to see when yours are finished. The brownies will stay fresh in an airtight container at room temperature for 1 week. These brownies can be kept in the freezer for up to 2 months.